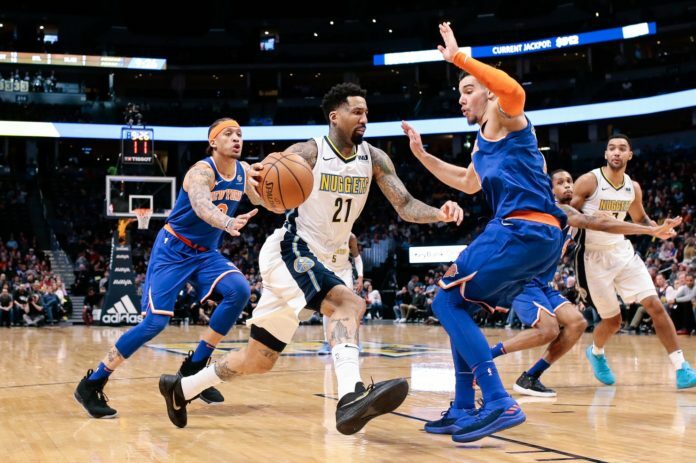 The Denver Nuggets hosted the New York Knicks on Thursday night for what was the first official Pride Night at the Pepsi Center celebrating individuals of all sexual orientations. The Nuggets played one of their best games of the year as they absolutely blitzed New York and nearly led this game wire-to-wire. Seemingly everyone was feeling it offensively as the Nuggets picked up the 130-118 win. The first quarter was one of the best quarters the Nuggets have played all season long. The ball movement was the story as the Nuggets recorded an assist on their first four field goals of the game. 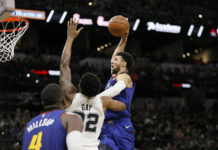 The ball was hopping, the shots were falling and Denver avoided their typical turnover struggles as they scored 22 points in the first six minutes of the game. The half-court offense looked reminiscent of last year’s, only it featured some stellar big-man to big-man action as Jokic found Plumlee for multiple looks near the rim. 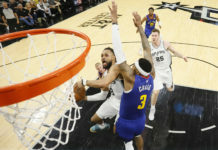 Both teams were hot; New York shot 56.5 percent from the field in the first while the Nuggets connected on 16 of their 24 attempts. The rebounding and turnover battles were virtually even, but Denver shot 6-8 from deep. They assisted on 14 of those 16 field goals and held a 39-28 lead after one. For the second straight game, Wilson Chandler came off the bench. For the second straight game, he provided a nice spark for the second unit. Chandler connected on his first three shots of the game and recorded eight points in his first six minutes of play, but the bench struggled to start the second quarter. New York whittled the double-digit lead back down to six before Nuggets’ head coach Michael Malone used a full timeout with just under ten minutes remaining. Then it was Trey Lyles’ turn. Looking comfortable in his more traditional role as a sub off the bench, Lyles dropped 12 points on 5-7 from the field in his first nine minutes. Seven of those points came in a two and a half minute stretch following the timeout and Lyles helped push the lead back out to double digits. Gary Harris took offensive the reigns from Lyles and scored 12 points in the final seven minutes of the first half. Denver wouldn’t look back from there. The three ball was dropping all half — actually, everything was dropping for Denver. They finished the half a ridiculous 9-14 from deep, held a 34-20 advantage in points in the paint and a hit on 64 percent of their shots overall as they led the Knicks 73-60 at halftime. Harris led all scorers with 18 points, which he reached in just 15 minutes on 6-7 from the field, and five different Nuggets recorded three or more assists — Jokic led the way with five of his own. The story of the third quarter was one of survival. This is typically when good teams pull away, but it was the Knicks who made a strong push coming out of the half. That crisp half-court offense from Denver that was featured in the first half disappeared, and New York’s starters were able to trim the 13 point lead down to eight. The Nuggets seemed to catch a break when Kristaps Porzingis picked up his fifth personal foul with about five minutes remaining, but Michael Beasley played well in place of the big Latvian — he scored seven points in the five minutes following the substitution. The Knicks outscored Denver 32-26 in the quarter and trailed 99-92 as the two teams headed into the fourth. That’s when Denver pulled away. 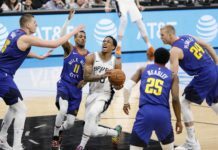 Trey Lyles, who injected serious life into the offense during his first stint, sparked another run by scoring seven more points in the first four minutes as the Nuggets pushed their lead back to double digits. While Lyles was rolling, his production was a smaller part of a larger story: a tremendous team effort. 7 different Nuggets entered double-digits in scoring while 6 different Nuggets recorded 3 or more assists — they finished with 36 total assists as a team. With the win, the Nuggets improve to 25-23 on the year and 18-6 at home. The Nuggets will have Friday off before they host the Dallas Mavericks on Saturday night. That game tips off at 7:00 pm MT.